We bought a Traeger Barbeque/Smoker last year. Each time we've baked a ham on the grill, it turns out delicious. This time I did a simple Marmalade glaze. I hope you enjoy it as much as we and our guests did. Alternatively, you can bake your ham in the oven as per package instructions, brushing the ham with the glaze every 20 minutes for the last half of the cooking time. 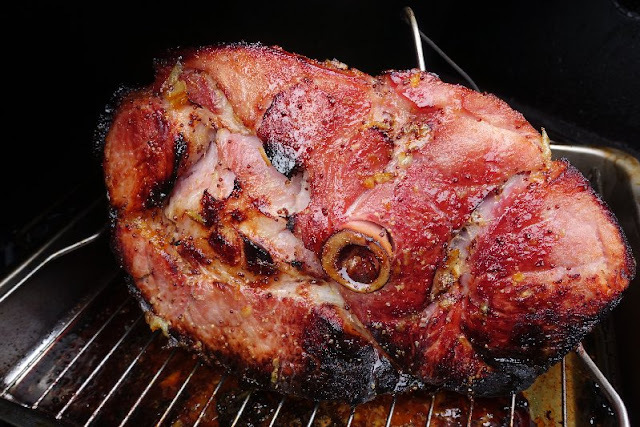 Place ham on its side on a rack in a roasting pan. Lightly score the fat on the outside into a diamond pattern. Do not cut too deeply into the ham. In a small bowl combine marmalade, mustard and balsamic vinegar. Mix well. Let ham sit for 20 minutes before slicing. If you have remaining glaze, heat it and pour over the sliced ham. Traeger Smokers are the best way to cook/ BBQ. We got rid of our propane BBQ shortly after we got our Traeger. No more flare ups or burnt burgers. Just smoked flavour! We'll have to try this on our new Traeger! I took your recipe as an inspiration for supper last night. I had fresh pork tenderloin in the fridge, so I made a marinade of apricot jam, "bold & spicy" mustard, and balsamic vinegar. I allowed it to marinate for about 5 hours then put it on my gas bbq for about 25 minutes. While it was cooking on the bbq, I brought the remaining marinade to a boil to make it a safe dipping sauce for the pork. Yummy!! Thanks for sharing that Lorrie. I love it when our readers take our recipes and adapt them to what they have on hand. Way to go. I'll be trying that on pork tenderloin soon. Oh boy - now I have to look up those Traeger BBQ/Smokers because my mouth is watering looking at that perfect ham! What a great recipe Bev!